New customers for above ground fuel storage tanks by Ledbury Welding and Engineering (LWE), include Collier Haulage of Pontypool, South Wales. 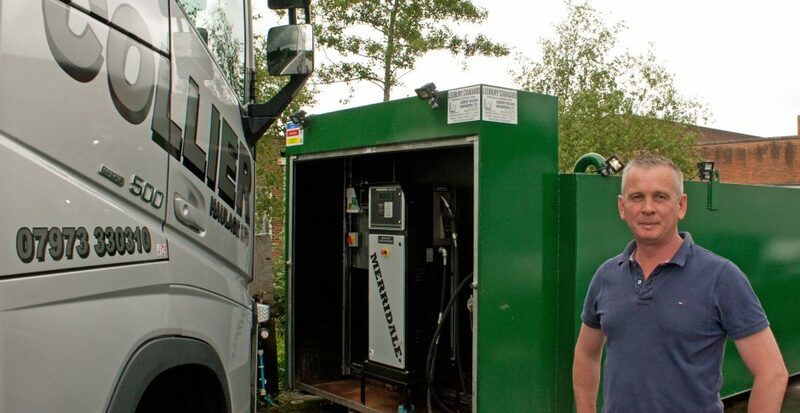 This family owned business has set up a depot fuelling station, enabling the owner to reap the benefits of bulk purchasing fuel supplies at spot market prices. “Currently our fleet comprises 25 articulated trailers and fuel usage is running at around 15,000 litres a week,” explains Gregg Collier. He continues. “Whilst third party bunker account services have served us well in the past, our business has now grown to a level where we can achieve better economies through bulk purchasing. Ledbury has supplied a complete fuelling solution based on a tank providing 45,000 litres storage capacity. The installation includes a dispenser pump, electronic monitoring and web-based fuel management service. He concluded by saying. “We chose Ledbury because we wanted a resilient solution, built to good engineering standards. Ledbury tanks are well known and are trusted throughout the road transport sector. With an annual throughput of stock worth more than £750,000, we did not want to make any compromise on build quality or performance.